If you're seeking a super-lightweight road shoe with a Boa dial and exceptional power transfer, then look no further than the S-Works EXOS Road Shoes from Specialized. 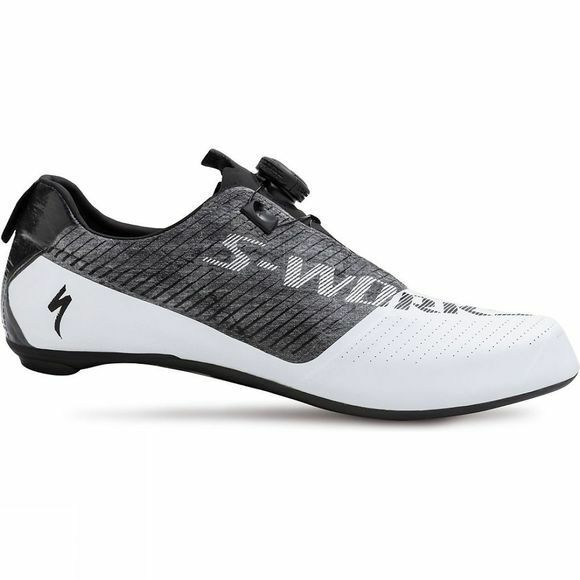 These feature all the quality and advancements that are synonymous with the S-Works label making these road shoes of a World Tour level, just ridiculously light. A mere 150 grams to be exact. Specialized's engineers worked hard to bring the weight of this footwear down without ever sacrificing power transfer. By using an advanced form of Finite Element Analysis and pressure mapping to pull out material where it wasn’t needed, they created the perfect carbon outsole with crazy-high stiffness numbers. They also removed the heel counter, opting instead for a space-grade Dyneema mesh and some CubicTec reinforcement so that the heel molds to the back of your foot. To further cut down the weight while also increasing comfort, Specialized's designers developed a Warp Sleeve vamp that could replace the toe box. With all of this technology, not a watt is wasted as you ride. 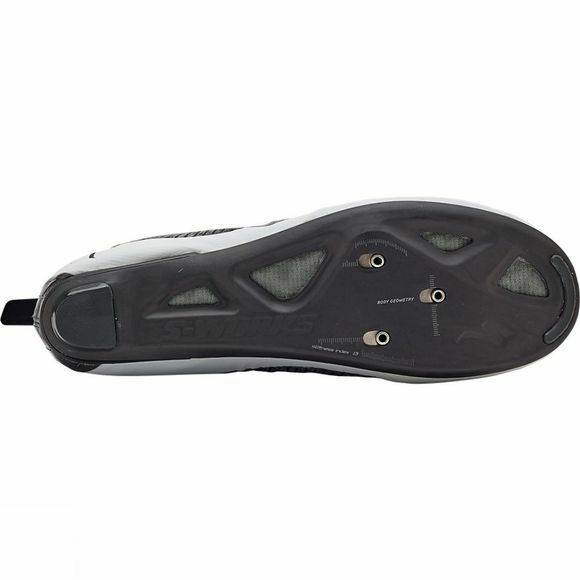 To maintain infamous levels of comfort Specialized stuck with the Body Geometry features that fans know and love, such as the Longitudinal Arch, Varus Wedge, and Metatarsal Button. All these aspects were ergonomically designed to boost overall power and scientifically tested to increase efficiency and reduce the risk of injury. Layers of Dyneema fibers comprise the upper. These fibers are oriented to lock the stretch in all four directions, which secures you to the plate. BOA IP1 dial for on-the-fly micro-adjustment, backed by the BOA Lifetime Guarantee. Form Fit last with a malleable vamp creates a next-to-foot fit.